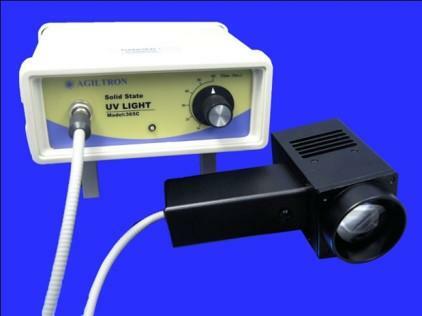 Agiltron’s hand-held Solid-State UV Flood Light produces a large diameter UV beam with high power intensity for curing UV adhesives and coatings. It is compact, lightweight and user-friendly featuring low power consumption. Together with a long operation life, the high power LED device provides marked advantages over traditional lamp based alternatives. Agiltron’s superior optical design achieves high light coupling efficiency of more than 85% as well as a well-distributed light spot intensity. The easy to use device can be switched on/off by either a front panel control or an optional foot switch. Highly efficient dissipation of heat allows the handset to operate continuously for more than 30 minutes. The exposure time and UV light power are adjustable. This unique UV LED spot curing light has high power density that exceeds UV lamps. It burns paper. The design leverages military gear development expertise. This hand-held 365nm UV light features fast and deep epoxy curing, compact size, and ease of use. It offers long operation life, excellent reliability, high energy efficiency. 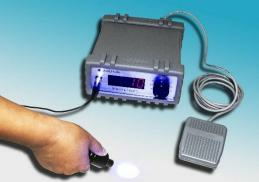 The UV light has a built-in timer and can be switched on/off either by a finger press or a foot pedal.